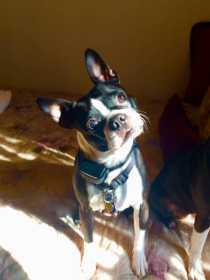 TINA is a 9 year old female Boston Terrier. Mostly black with white neck, white blaze and chest, front legs are mostly white. Longer snout than traditional Boston. Spayed and microchipped. Black harness with rabies tag and blue microchipped tag with heart-shaped name tag (has old # on it) Correct number to call: (573) 680-4148. Substantial Reward for Tina’s Safe Return. Rural Holts Summit Mo area.